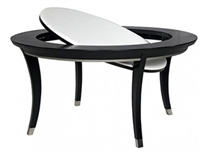 The Jamie pool table is designed with sleek wooden legs, accented with a stainless steel base. Its fashion forward design has made it highly desirable for not only billiard connoisseurs, but for today’s smartphone and app mentality generation. A generation that reflects a smaller footprint moving away from the excessive overdone bling. It features enclosed pockets, stainless steel trim, and scaled down proportions paired with a multi-purpose design. Purchase the coordinating dining top to make it the centerpiece of your room (add $1,549). Choose a finish that best suits the aesthetics of your room, as well as your personal taste, and remember that many of our other items are available in the same finish. Click Finish FAQs in the section below for more details. 7 foot tables come with three piece unbacked real slate ($450 additional charge). The 9’ Harper shuffleboard features a clean stainless steel design with minimal lines. Designed with play and work in mind, it can double as a shuffleboard and dining or work table. It includes the dining top that will make it a focal point in any room. Experience play and work just about anywhere. It’s group entertainment at its finest. With versatility in mind, the Harper Shuffleboard is available in a traditional shuffleboard height (110”L x 42”W x 36H”) or the cutting edge café height (110”L x 29”W x 30”H).